On Day 7 of my 18 Day Painting Challenge I pulled the following prompt: "a scientist or researcher who positively impacted mankind." 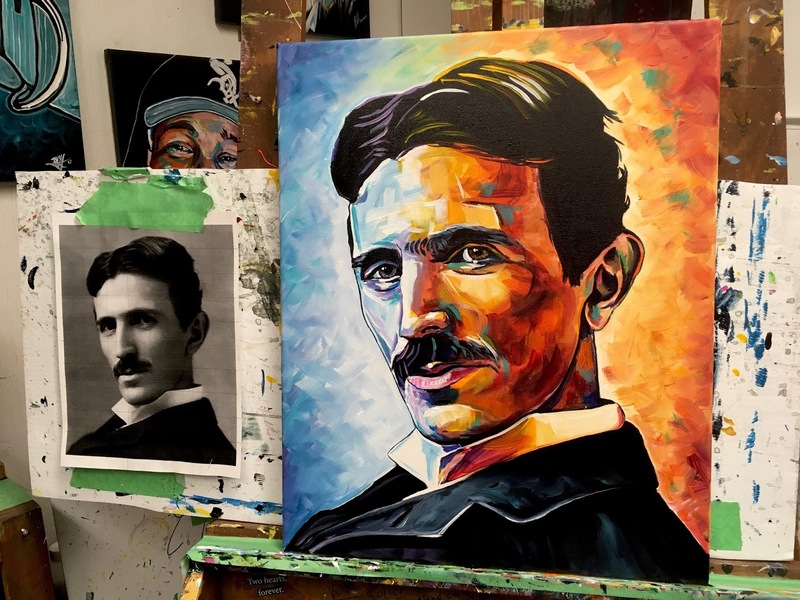 The name that popped into my head right away was Tesla - a client had suggested him as a subject for her husband at an exhibition opening. 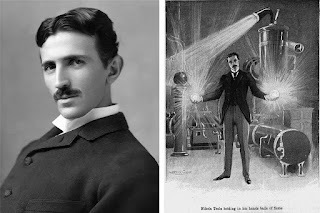 To be honest, I didn't even really know what Tesla was all about when I went searching for an image of him. Simply stated, Nikola Tesla invented the alternating current (AC) electrical system that every single one of us benefits from every single day. He invented a lot of other things but nothing can top the one that enables me to type this blog, make toast and watch Netflix. Born in what we now call Croatia, Tesla came to America in 1884 and briefly worked with Thomas Edison. If you want to read more about the man, click here. My schedule for doing this challenge - finishing the painting before 9 am - got screwed up yesterday because I had an early morning medical procedure. Every 12 to 18 months, the hearing in my left ear slowly goes away. I have a tube that is placed in my eardrum that helps fluid in my middle ear drain. However, after a certain amount of time, it either gets plugged or falls out. After a short procedure and a nice visit with Dr. Kudryk, I can once again hear in stereo. "How many years have we been doing this?" he asked. "I honestly don't know," I replied. "But I know I wrote about the first time you did the procedure in my blog. I'll check when I get home." It turns out that it was 2010, which explains why Dr. Kudryk and I have been seeing each other for a long time. I got home and sketched out Tesla on the canvas before heading out to a coffee visit with Randy and Lynne. One of my New Year's resolutions was to move away from suggesting that I have coffee with people (an never getting around to it) to actually locking it into my very busy (not) schedule. We had a lovely time talking at their kitchen table in their Grayling Terrace home, watching the birds and the squirrel in the backyard. After a hearty lunch and my requisite 10 minute nap, I jumped into the portrait of Mr. Tesla. I decided to stay in the wild colour style with this one, starting with the warm tones on the right and moving over to the cool ones on the left. Just having his face floating on the white canvas looked amazing. I knew right away that this was going to be a special painting and decided to spend more than my allotted hour bringing it to completion. The extra time was worth it. Several people expressed interest in owning this one, but it will be going to the person who originally suggested it. Several others will be ordering prints of it. All proceeds will support our efforts to put a roof over a family's heads in Cambodia this November/December with Bracelets 4 Buildings.